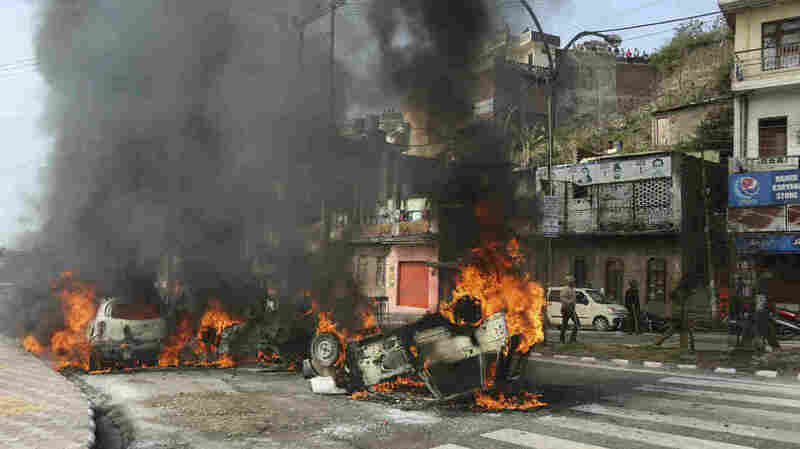 Kashmir Bombing Leads To Renewed Tensions Between India and Pakistan The government says it is taking steps to isolate Pakistan, which it blames for Thursday's fatal bombing. Pakistan calls the violence a result of "brutalities of Indian occupied forces in Kashmir." A mob in India set fire to vehicles on Friday, in protest of Thursday's attack on a paramilitary convoy in Kashmir. Indian Prime Minister Narendra Modi has promised a "befitting reply" for perpetrators and their supporters in the wake of a bombing in Kashmir described as the deadliest in three decades that killed at least 40 Indian police troops and wounded nearly 20 more. In the attack on Thursday on the outskirts of Srinagar, the capital of Indian-administered Kashmir, a suicide bomber rammed a vehicle with explosives into caravan carrying paramilitary troopers. Pakistani-based militant group Jaish-e-Mohammed, or JEM, a U.S.-designated terrorist group, claimed responsibility for the act. The bomber himself was a local Kashmiri, identified in the media as Adil Ahmad Dar. The bodies of victims were transported to New Delhi and saluted by Modi on Friday. That morning, a 12-member team from the country's National Investigation Agency headed toward Pulwama, the site of the bombing, according to India's NDTV. Himalayan Kashmir has long been disputed, with both India and Pakistan claiming the Muslim-majority region. Following multiple wars over Kashmir, an uneasy truce prevails along an unofficial demarcation known as the Line of Control. Even so, thousands have been killed in a low-level insurgency that New Delhi blames Islamabad for fueling. The most recent attack has caused tensions between the rival nuclear powers to quickly flare up once again. India's Ministry of External Affairs blamed Pakistan for supporting militants in the area – including JEM's founder, Masood Azhar, who has "full freedom by [the] Government of Pakistan to operate and expand his terror infrastructure." Since the bombing, India has recalled its envoy to Islamabad. An Indian government official tells NPR the high commissioner to Pakistan was "called back for consultations." Authorities have also summoned the Pakistani ambassador in New Delhi and demanded that his government take "immediate and verifiable action" against the group claiming responsibility for the bombing. Meanwhile, Indian Finance Minister Arun Jaitley told reporters that the government is taking all possible measures to ensure the "complete isolation" of Pakistan from the international community.